But restaurants can’t completely control their clientele. 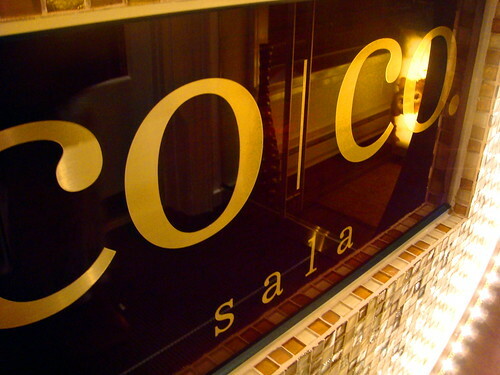 If you worship at the altar of cacao, Co Co. Sala deserves a taste. Just be prepared for a bit of a scene. And after knocking back a “Disia” – their lychee rose cocktail that tastes like Aphrodite’s elixir – I was mellow again and ready to give an entire chocolate dinner a try. If the idea of an entire meal of chocolate is a bit daunting, even for dessert, take heart. Co Co. Sala also features small bites, and though our server suggested “three or four” to start, two each was quite sufficient. I tried the Moroccan swordfish, which turned out to be a spicy little sandwich with fennel and pecorino. The manchego and arugula salad (pressed into a square with nuts and fruits) was refreshingly peppery, if a bit overdressed. Both provided a good complement to the chocolate feast that would follow. Faced with choices of chocolate courses that aim to provide a “monde du chocolat” (again, very girly, all this), I went with the Xocolatyl Aztec Experience, figuring as I’m not really a sweet tooth kind of girl, anything that mixes sugar and spice is bound to please me. From first – churros with cinnamon cream and dulce de leche dip – to second – chocolate souffle with fiery chocolate center and kahlua soother – and third – chocolate infused horchata with Mexican wedding cookie – all were beautifully presented. There was a constant, cooing chorus as people eyed each other’s plates and craned their necks at other tables. Every course was an interesting attempt to bring out different aspects of chocolate. Later in the evening, as we were slowly surrounded by canoodling couples, the estrogen party at the bar was still going strong, complete with woman breastfeeding baby. I suppose that if for some, chocolate = life, this was perfectly natural. For me, it was disconcerting. But, I settled back into my lychee-rose-hazed-chocolate-endorphin high and let it go. The customer service there is exquisite and they are very very liberal with the samples. god i love co co sala. i could have co co sala every day. but then i would fat. but i would be happy too. anyways… Jenn, you should forgo the flights and go for the ala carte items, the mac and cheese is to DIE FOR (hey, bacon, how you durrin?) and the lobster salad and bite-sized burgers are super yummy as well. Thanks, Mike and Katie, for the suggestions! it sounds yummy and all, so no offense meant to you or them. I’ve just never read the exact same review of one spot so many times as i did in the early coco days. No, washwords, I am not being paid by Co Co. Sala for this article, nor have I been paid by them (or anyone else, for that matter, for any place I review). Considering this isn’t a 100% rah-rah review, it’s interesting you would think to suggest that. But, no offense taken, I read all about that “controversy” earlier and in several places. There’s a lot of viral marketing out there, obviously. People just have to consider review sources and their own opinions in deciding about any restaurant. In the end, it’s your taste buds.